EASY chicken dish – only 5 ingredients not counting S + P! Skinless chicken drumsticks are seasoned with lemon, oregano and spices then slow cooked in the crock pot. When done, they are topped with fresh grated feta – YUM! Every now and then I like to take recipes I would normally make in the oven and try them out in my slow cooker. 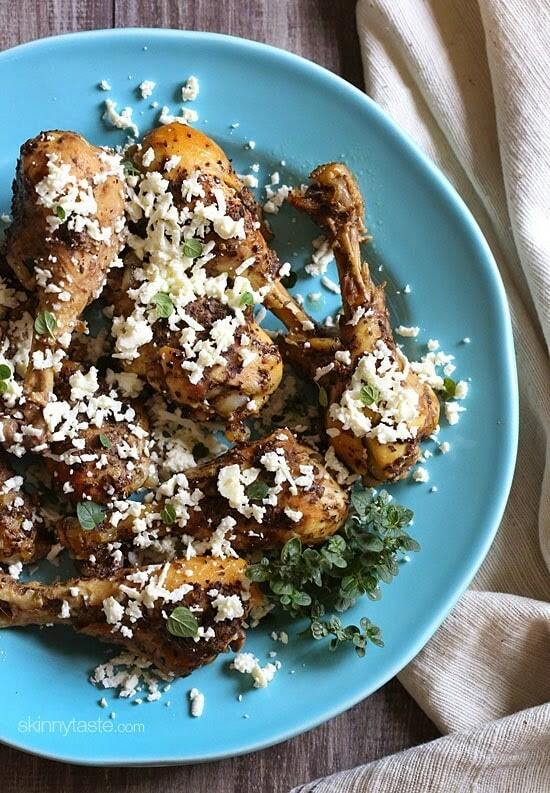 Some of you might recognize this Roasted Lemon Feta Chicken recipe from the archives. Often they convert great for the slow cooker with some slight modifications. 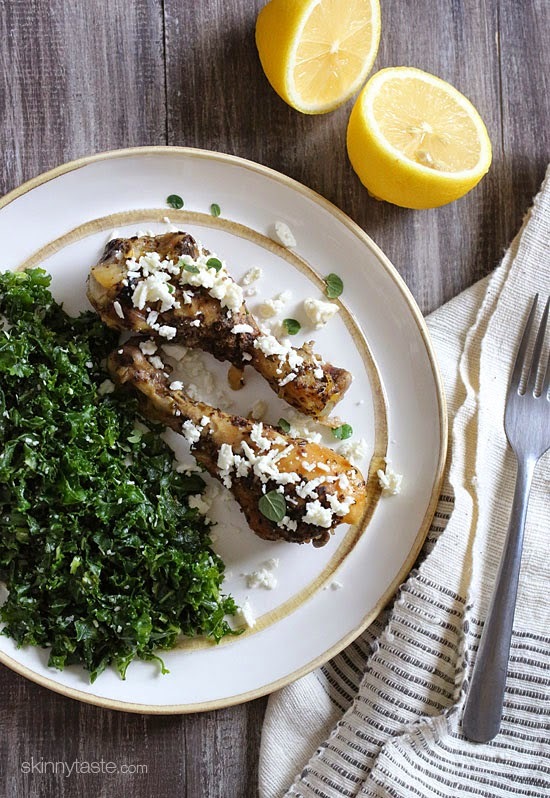 These drumsticks were fall of the bone, with great flavor and the only difference was rather than adding the feta and broiling them in the oven, I served the chicken on a platter and added the fresh grated feta cheese after which melted from the heat of the drumsticks. I highly recommend buying a chunk of feta and grating it yourself, it’s moister and tastes so much better. 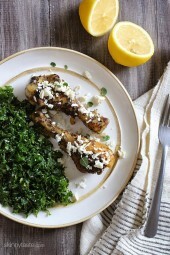 I served this with this massaged raw kale salad using feta instead of parmesan – an easy inexpensive meal. Season chicken with salt, pepper, garlic powder, oregano, and lemon juice. Place in the slow cooker and cook on HIGH 4 hours, or until chicken is no longer pink in the center near the bone. When chicken is cooked through, sprinkle with grated feta and cover until cheese is melted. *My drumsticks were small, I weighed the cooked meat off the bone on one and it weighed 2.5 oz. This is how I calculated points since there was no skinless on the bone option. If yours are larger you will need to adjust. If I wanted to make this but cook it on low. How long would you suggest? Would it still be 4 hours or longer? LOVE this recipe. Easy to do and taste delicious. My family couldn’t stop eating these drumsticks. Made the kitchen smell amazing too. 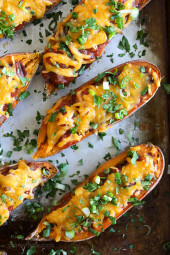 Why isn’t this a keto-friendly recipe (when the non-slow cooker version is)? I love this meal but just started the keto diet so I hope I can still have it! Great, thanks!! Also, do you recommend fully defrosting the chicken (mine is frozen) or would I be able to cook it a bit longer in the crockpot without first defrosting? I have never cooked frozen. Do you think this would convert to the instant pot? Same question: has anyone tried it in the Instant Pot? Hello Gina I really love this recipe a lot and for whatever reason today I forgot to take the skin off of the legs. do you think it’ll still turn out? Hi there! Can you do boneless chicken breasts for this recipe? If so, do you know how many points this would be? Thanks! Is boneless chicken breast ok? And HIGH 4 hours as well? 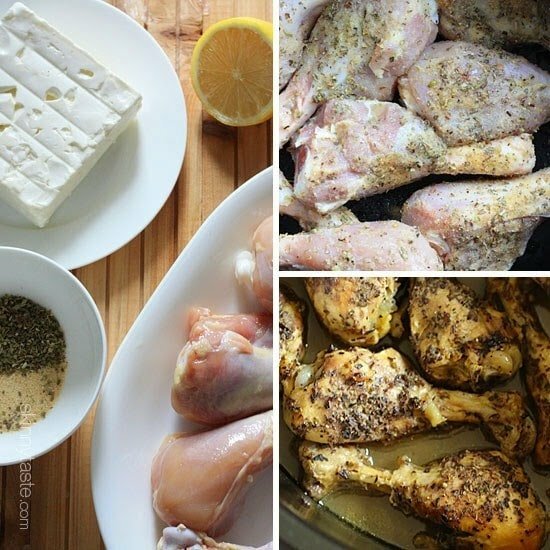 This recipe totally changed my view on drumsticks! I love them now that I know how to remove the skin. This recipe is excellent! Please help! Making this tomorrow for a crowd. Do breasts need more liquid? Should the liquid just come up to the meat??? This was such an awesome recipe! It took less than 5 minutes to prepare, and I had all of the ingredients except for the chicken (which was super inexpensive). I like this recipe because it inspired me to cook with drumsticks, which I normally wouldn't pick because I don't love the texture. However, with the skin removed and cooked in the crockpot, they are incredible! The meat just falls off the bone and is so tender. What a great way to make a tasty, inexpensive meal! I thought this recipe was wonderful – thank you! I cooked mine for 7 hours on low. I have a programmable crockpot (HIGHLY, HIGHLY recommend this.. I got the one Gina has), and it switched to warm after that. It was probably on warm for 2-3 hours after that. It turned out GREAT – falling off the bone tender! My store only has drumsticks with the skin on. It's easy to remove the skin using a paper towel. Otherwise, it's a little slippery to remove the skin. I found that while not having skin on them, the drumsticks still had a nice slightly crispier layer on top. The juice from the lemon was plenty of liquid to keep the chicken moist and delicious. The salty flavor from the feta really compliments the meat! I was really skeptical about the only liquid in this being the lemon juice so I set this to cook overnight instead of while I was at work, in case I needed to come up with a back up plan. Happy to report that there was plenty of liquid. Can't wait to eat for dinner tonight! Wow! Ruined my chicken. I cooked on low for 4 hours and it was dried out. Needs more liquid. I will stick to cooking it in the oven for only 30 min. Can you make this with just chicken thighs? If so – how would I adjust the cooking time? Can I keep the skin on the drumsticks if I am not concerned about the WW points? Hi there. This is one of the reasons I might be using thigh instead of the drumstick. It's also my favorite part of the chicken you know. I'm thinking this recipe wouldn't be too much of the cholesterol overload. The slow cooker could be extracting the chicken oil and extra fat (I guess). I've always believed in this article I came across with, http://bit.ly/1xF84sE so long as I am eating at the right time and in moderation then, I should be good. Can chocken breasts be substituted for the drumsticks? I have seen this question posted a few times, but haven't seen the answer. Can those who work during the day cook them on low for 8 hours? Or is 4 hours on high the preferential method? thank you! I too would like to know if I can use chicken breast if so would the time be the same? 4 hours on high? or can I cook it for 8 hours on low as I work during the day.. Thanks! A delicious meal. Catherine. I will try it for my kids. If I add more chicken legs – do I have to increase my cook time? I love your recipes! I just received an email that ZipList was disbanding or something. In that case, will you be transferring your "Save this recipe" over to Epicurious or another site of the sort? 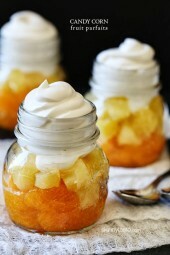 Or will we need to start/continue pinning your amazing recipes? I just love them so much so I don't want to lose them. I want to make sure I can keep adding them to a safe, easy to access spot. Just wondering what you were planning to do! Thanks so much!! What a delicious idea! Love that it's not the usual barbecue recipe 😉 And so pretty! I'm not a fan of drum sticks, can I use boneless thighs or boneless chicken breats? I am NOT happy that ZipList is shutting down, hopefully the new option that is being offered is as user friendly as ZipList is. GINA Can I cook them on low for 8 hours or is 4 he's on High more recommended. Can I substitute chicken breasts? Would the cooking time be the same? do they 'crisp up" or is the skin soft/soggy? The legs used should be skinless per the recipe, so no skin to get crispy. Just tender, flavorful dark meat. My fav! This looks amazing! though I will probably make the oven version as I don't own a slow cooker. My grocery store had chicken legs on sale this past week and so I stocked up! I was just sitting here pondering different recipes I could use with them. Definitely putting this on the menu this week! Gina, can chicken breasts be used instead? Would the cooking time be the same? These look delicious. I love the slow cooker. I have been cooking many of the recipes in your book and they have been a hit in my house, can't wait to try this one as well! Well, having lived in Greece for many years, I LOVE this. I cooked a whole chicken in the slow cooker the other day and was a bit disappointed – too messy when I took it out. I think this is the better way to go! I will definitely be trying this! I love lemon and feta, but don't think I've had them together. Can't wait to try this! Hi Gina! I received and email from Ziplist that they are going to be shutting down December 10th. I am very disappointed to hear that as I use the app almost exclusively, and cook from your site all the time. I was wondering if you had any thoughts as to what you will use going forward? I'm actually stressed about this, lol. I cook from here all the time and use ziplist exclusively also. Not liking that other app. I'm really upset about this too! I asked them if they had thoughts on creating another service, hoping it is in their future. They are switching over to Epicurious. I use Pinterest to catalog recipes, which works fairly well! I just have a board specifically for recipes I want to try. 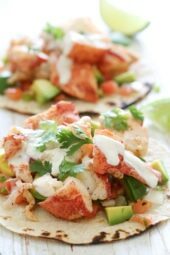 I registered for Taste of Home and am able to add recipes from Skinnytaste in my recipe box there. Very convenient! This looks DELISH!! What do you think the calories would be for breast only?